I’m sure a goodly number of readers are already aware of this as I’ve been tweeting and facebooking it quite a lot, but I have a science kick-starter project running on the Microryza site. 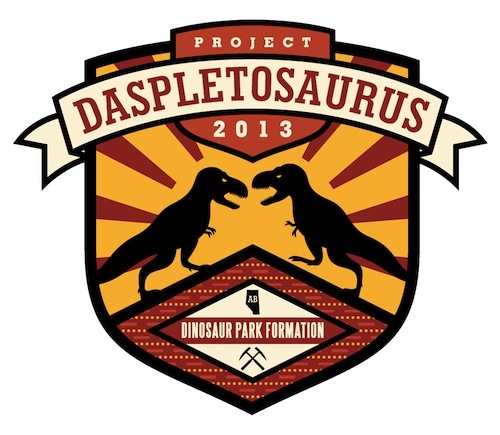 It sounds almost too contrived to be honest, but it’s a project aimed at looking at possible cannibalism in Daspletosaurus based on material Darren Tanke has worked on at the Tyrrell. Obviously Darren and I have form when it come to tyrannosaurs, both with our own research interests and in particular with the Gorgosaurus preparation project. Here though it’s a skull of Daspletosaurus with bite marks attributable from another large tyrannosaurine. I’m looking for funding to get me out to Alberta and check out this and related material and work to write this all up and hopefully learn something about tyrannosaur behaviour and ecology. I’ll skimp on the details here because it’s all up on the Microryza site, so do follow this link and take a look. More specifically, if you can spare a small amount towards the total, it would be very much appreciated and do please blog and tweet this – the model only really works if people know about it and are intrigued or excited so spreading the wrod is very important (and free!). Obviously I’ll be blogging the project and putting as much information out as I am able, so I hope to make this as open as I can and get the audience involved. My thanks to Microryza for supporting this, and to David Orr for the fantastic logo up top and Matt van Rooijen for help with the project video (featuring much Matt artwork). I just added my backing at Microryza and posted to Facebook. I’m glad to see Microryza moving forward with new projects. That’s great man, many thanks! Every bit of help is very welcome, be it tweeting or a little bit of cash.